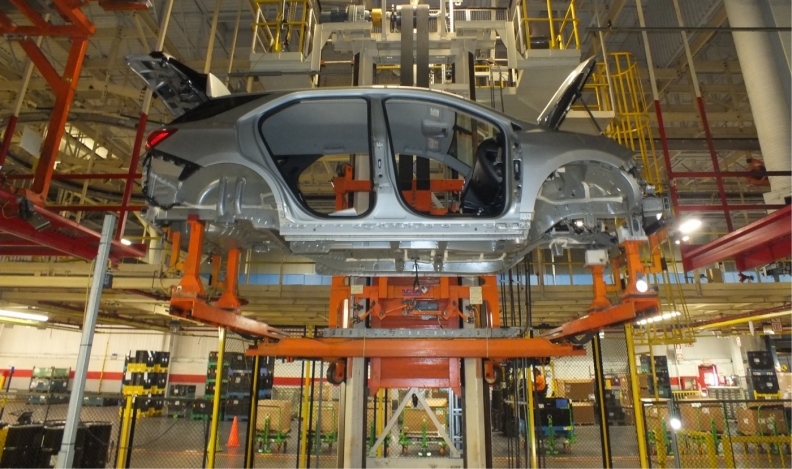 A Chevrolet Equinox, popular in the United States, rolls down an assembly line in Ingersoll, Ont. Canada would lose almost half of its auto assembly production if U.S. President Donald Trump follows through on his threat to slap imported light duty vehicles with a 25-per-cent tariff, according to a new report by CIBC. Trump has already implemented tariffs of 25 and 10 per cent on Canadian steel and aluminum respectively, citing national security threats. Now, U.S. officials are looking into whether autos might also be a threat and warrant tariffs. "It wasn't that long ago when it was commonplace to question whether President Trump could make good on his promises. But, so far, he's generally found ways to stay true to his word, and that's exactly what's so concerning about auto tariffs," CIBC Capital Markets Senior Economist Royce Mendes writes in a report entitled Auto Tariffs: More Than A Fender Bender. Mendes notes Trump has several options at his disposal, but most detrimental would be a 25-per-cent tariff on only new vehicles imported from Canada, which would cut production here by 900,000 units. If Trump slapped the tariff on all imported vehicles, it would lead to a production decrease of 400,000 units in Canada. Canada produces slightly more than two million vehicles a year, and about 85 per cent of those are exported, mostly to the United States. German Chancellor Angela Merkel said on Thursday she would be willing to lower European Union tariffs on cars imported from the United States as Washington offered to abandon threatened levies on European cars in return. Meanwhile, Trump hasn’t said whether Canada will receive an exemption. Mendes said Ontario would bear the economic brunt of import tariffs. “Such a shock would likely throw the province into a mild recession, and depending on the speed at which production tails off, risk one at the national level as well,” he wrote. Mendes said such a steep drop in production would decrease Canada’s GDP by 0.5 per cent to one per cent. He also said retaliatory tariffs on American-made vehicles wouldn’t do a thing to force Canadians to buy domestically produced cars and offset loss of production. Only about 10 per cent of cars made in Canada last year were bought by Canadians. "Canada only produces a handful of models relative to the hundreds of choices to which consumers have become accustomed to," he said. "Unless you believe someone looking to buy a flashy drop-top convertible sports car would be satisfied leaving their local car dealership with the keys to a minivan, it isn't a feasible solution to the potential problem at hand."